Do YOU know the proper regulations and guidelines for Confined Space Operations? These spaces may include, but are not limited to, underground vaults, tanks, storage bins, pits and diked areas, vessels, and silos. Contains any other recognized serious safety or health hazards. Many workplaces contain spaces that are considered to be “confined” because their configurations hinder the activities of employees who must enter into, work in or exit from them. In many instances, employees who work in confined spaces also face increased risk of exposure to serious physical injury from hazards such as entrapment, engulfment and hazardous atmospheric conditions. Confinement itself may pose entrapment hazards and work in confined spaces may keep employees closer to hazards such as machinery components than they would be otherwise. The terms “permit-required confined space” and “permit space” refer to spaces that meet OSHA’s definition of a “confined space” and contain health or safety hazards. For this reason, OSHA requires workers to have a permit to enter these spaces. If you are ever unsure of whether the space is permit-required, always contact OSHA. It is better to get the proper assistance from the required certified and experienced technicians, than face the penalty of paying double, triple or more for fines, penalties, injuries or deaths. To avoid this situation, contact Protect. We specialize in all your confined space and environmental needs. OSHA’s standard for confined spaces, 29 CFR 1910.146, contains the requirements for practices and procedures to protect employees in general industry from the hazards of entering permit spaces. OSHA’s role is to promote the health and safety of employees by setting and enforcing standards, training, education, and encouraging continual improvement in workplace safety. Protect Environmental fulfills these standards by educating and training its employees on an annual basis, and prior to any confined space operation projects. Employers are responsible for providing a safe and healthy workplace for their employees. OSHA requires written programs, controlling hazards, equipment for safe entry, detection of hazardous conditions, informing contract employees, entry permits, lock-out tag-out, worker training, assigned duties for the attendant, supervisor, CPR certified first aid trained rescue and entrant. If employees are not to enter and work in permit spaces, employers must take effective measures to prevent them from entering these spaces such as posting signs: “DANGER—PERMIT-REQUIRED CONFINED SPACE—AUTHORIZED ENTRANTS ONLY”. 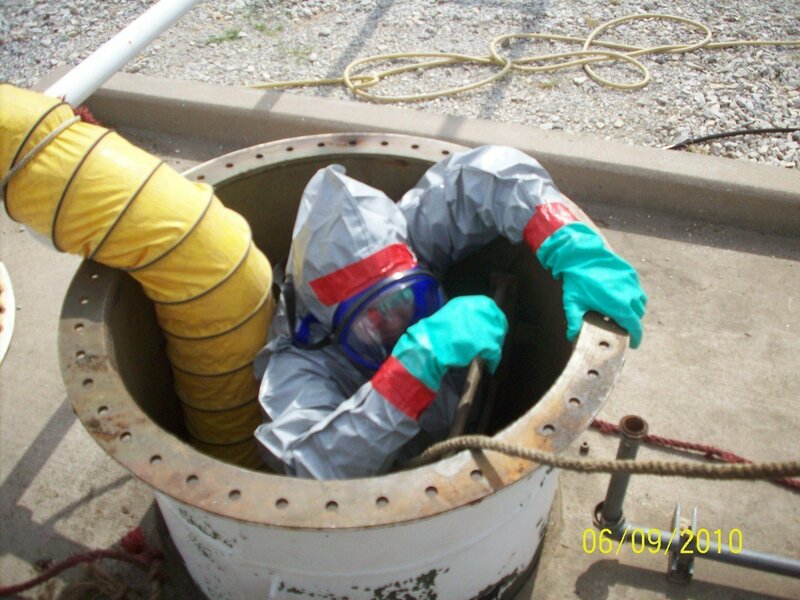 Protect Environmental is a leader in confined space operations, standby rescue and tank cleaning. For more than sixteen years Protect has assisted Fortune 100 and Fortune 500 companies, as well as Federal, State and local agencies to control costs and limit liability. For more information, or on how we might be able to serve you, please call us at (817) 589-9005.